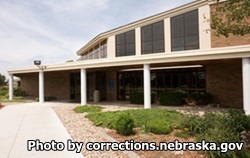 Community Corrections Center Omaha is a community custody A and B status facility that houses inmates who are close to the end of their prison term, and nearing release. This facility is self contained, but shares services with Omaha Correctional Center which is located adjacent to the facility. Community Corrections Center Omaha currently houses about 156 male inmates and 24 female inmates. Programs offered at this facility include Alcoholics and Narcotics Anonymous, Substance Abuse Counseling, and the ability for offenders to earn a GED. The average span an inmate is incarcerated at Community Corrections Center Omaha is 6-24 months. Offenders are classified as either community custody A or B status. Custody A offenders are given closely supervised work assignments and provide vital services and labor to the correctional facility performing food services, landscaping, maintenance, janitorial work, and laundry. Custody B status inmates are allowed work release and are required to place 5% of their earnings into a savings account that will be used once they are released, an additional fee of $12 per day must also be paid for room and board. Before you may visit an inmate you must have an approved visiting application on file. The visiting hours for Omaha Community Corrections Center change frequently, ensure you have the right visiting hours before attending a visitation session by calling the facility directly. The visiting hours for Community Corrections Center Omaha are Saturdays and Sundays from 12:30pm-3:30pm.